Willem Marinus Dudok was first director of Public Works (1915-1928) and then City Architect to Hilversum (1928-1954). In both capacities he set an indelible stamp on the architecture and planning in that city. Obviously this is most legible in the monumental, visually defining city hall which has become almost synonymous with Hilversum. But his many housing projects, schools and other municipal buildings have exerted a more fundamental influence. 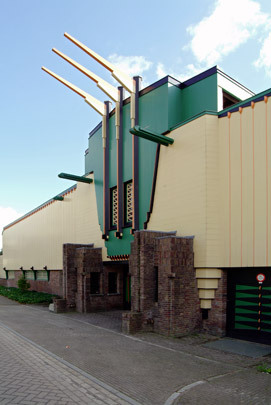 Out on a limb stylistically is the City Sports Park of 1919, the first of Dudok's Hilversum works. Here, expressive tiers of wood seating decorated with geometrical patterns and painted in light bright colours sit atop a brick basement. This feature is now part of a business park (Arenapark).